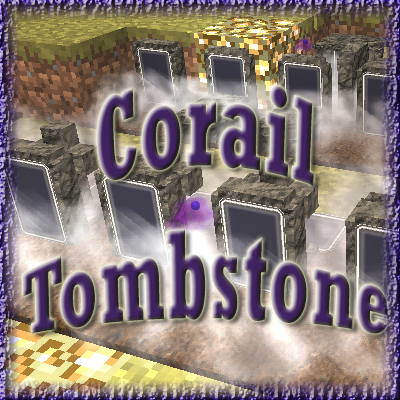 " Corail Tombstone keeps you from losing your belongings on death, with many features of survivability and dimensional teleportation, in a medieval fantasy atmosphere related to the grave's souls. " Tombstone handles your death in minecraft by providing over 100 config options, multiple features (like soulbound enchantment, auto-equip, the Grave's Key allowing to see the grave at a distance and teleport to the grave once enchanted), and several compatibilities between mods. On the same time, it introduces a slow perk tree : the Knowledge of Death, and a magic system based on some enchantable items with the help of the Souls haunting the Decorative Graves and waiting a way to be freed for their eternal sentence. There're several commands related to death and dimensional teleportation. The decorative graves are special blocks with a fog particle only during the night. They can be harvested with shovel/pickaxe and can be engraved with the anvil (and an iron lingot in the second slot). The decorative graves can be haunted by a soul, depending on the chance set in the config. The soul stays until used and allows some enchants like magic scroll/tablet, or upgrade the grave's key. Hint : The advancement/achievement gives you rewards, nearly enough to build a decorative grave. Players earns knowledge points each time they use a grave's soul to enchant an item, when they free a soul from a receptacle, by praying near a decorative grave with a special item called Ankh of Pray (with a cooldown of 6 in-game hours), or by accomplishing the tombstone advancements. Theses points allow you to unlock some perks in a special gui "Knowledge of Death" (the keybind in "misc" is not defined by default). The perks are small bonus related to all the features of tombstone, instead of providing them by default (some of them will be displayed based on what is allowed in the config). The compendium is a special section of the gui of the Knowledge of Death that provides infos, linked between them, about Tombstone. It would be cool to have a dirt block (Like at the base of the gravestones) that creates the fog so that you can create foggy areas without tombstones. Is it compatible with Baubles? I mean, does it save Baubles trinkets on death? The compatibility with Baubles is only to reequip correctly your baubles slots when recovering your inventory. It's true that i present it without showing all details but there're a lot, that's why i'm adding the compendium in game to provide more infos. Hey Corail31, a tip for you, your mod should be compatible with DimensionalDoors mod 1.12.2. When I die in DimensionalDoors dimension, I am automatically teleported to the Limbo and my inventory is kept with me. But with yours mod installed, a tombastone is placed where I died in that dimension, and the inventory is kept inside the tombstone, and most of the times that someone dies in that dimension is by falling into the void, then it is impossible to reach the tombstone. Could you do something so it do not creates tombstones when you die in the doors dimensions, neither in Limbo? Put the key together with an ender ball and keep pressing right click, you will teleport to the grave. The tomb will not be in a vacuum, but in the structures of the dungeons. It is a good trick to return to the dimension. I regret my writing I'm directly from Google Translate. Hey, how does this work with pvp exactly? I noticed you have a "pvp mode" in your config set to true. How does that work exactly? Can the winner open the grave for it's contents? with this option, if a player kills another player, the grave is not locked and can be opened by anyone. 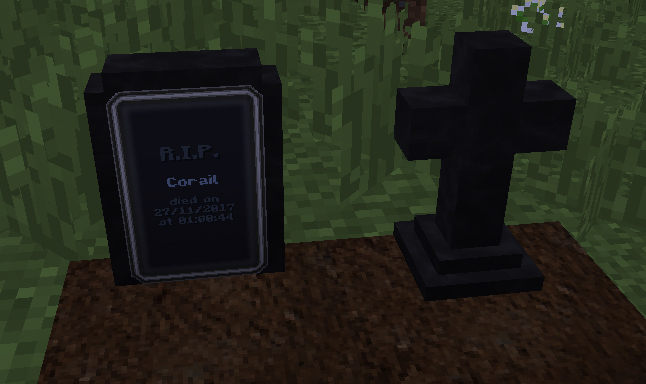 Hey there so my issue my brother has a server that i play on but when i die i dont get a key and a grave doesnt appear? but if i go into singleplayer it works fine. We went through the files and everything is the same. We are playing the "minecraft mage" modpack on twitch. be sure to check the log as if a mod is cancelling the death event, you'll have log about it, or if you have any other error indeed ;) And be sure, if you use nucleus & sponge to disable the "keepInventory" for admins in this mod ! I have a problem, and it is for some reason, when there is no new version. You can open an issue for it with enough details about what you think that is not working in Tombstone. Could it be some incompatibility failure? The mod has some incompatibility with some other mod? Wait, we are not understanding. I do not speak English, so I have to use the google translator: / and there are usually translation errors. After correctly analyzing your previous comment, I guess you are asking me for more details. True? Then I will give them to you. Before the last update when dying a black tomb appeared and could be seen no matter the distance, and when they reappeared they gave you a key. Now there is only one white grave with the name and date of death. honestly if you don't speak english (and as i'm speaking french), it will be hard to help you to even understand what is your trouble... My ask was to use the link above allowing to reach the section for bug submission.... and not here in the messages. What about to first test to localize what is the mod that is doing bad code (as some mods are doing stuf that they should stay away like CTM and so on) and also checks if it's not related to forge version. A screenshot would help too to understand. I fixed it, the problem was the CTM. I had to erase it but I did not need it. Was annoyed by the ghost in MS3D. Was annoyed by the comment to read the changelog. Found the changelog, read the changelog, read the item descriptions in-game. Became really impressed. Thanks for a great twist on death and gravestones.